For those who need to manage projects of all sizes and create presentation project reports. Has all the features of other Milestones software. Produce presentation reports from your Microsoft Office Project schedules and keep them up-to-date. Easy schedule creation with an easy click-drag-and-drop interface. Beautiful schedules, ideal for presentation. Combines powerful project scheduling and tracking capabilities with ease-of-use. Easy schedule sharing with a Free Viewer and built-in “Save as PDF”. Easy integration with Word and PowerPoint. Choose from a variety of presentation-ready formats including Earned Value, Resource, Summary, Milestone and Gantt. Customize the results to meet your reporting needs. Manage large projects and coordinate team projects. Format your schedule to meet any reporting needs. Calculate and present Earned Value. Enter BAC and Actual Cost and other EV fields are automatically calculated. Three calculation methods available. Robust Internet Publishing, including “drill-down” for easy management access to project details. Automation interface makes it possible to programmatically combine data from many sources into presentation schedules on-the-fly. Milestones Professional contains all of the features of Milestones Simplicity. It is recommended for professionals whose primary job function is project management or project scheduling. Best for those who need an easy tool for quick preparation of basic project charts. 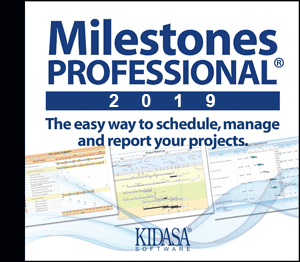 We have a lot of example schedules on our website – see what kind of output is possible with Milestones Professional. 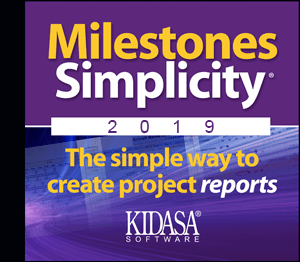 Check out Milestones Simplicity yourself – the only limit is your imagination (and 20 file saves)! We also have a lot of videos and video tutorials related to our Milestones Software – we’re adding more all the time. Click here if you’re ready to purchase Milestones Professional or Milestones Simplicity. You can also see our comparison of Milestones Professional to OnePager Pro.